Though on occasion I've gone through a period of interest in comic books, I wouldn't classify myself as a superhero fan. I do love Hellboy, but I don't really consider him a superhero per se. At times I've enjoyed reading the X-Men and whatnot, but if there's a superhero I really appreciate, it's Batman. There are countless Batman stories out there, and toy company DC Direct has worked hard to give us a figure from each one of them. But one of my favorite Batman stories is Gotham by Gaslight (1989), the first Elseworlds story (the brand was applied retroactively). Gaslight places the Batman story in the late Victorian era, with Batman tracking Jack the Ripper, who's now running loose in Gotham. I've always thought the Batman concept had a number of holes when set in modern times. In a world of cellphone cameras, tenacious paparazzi, satellite photography, internet hacking and advanced forensics, how could Batman possibly maintain his secret identity? Moreover, while Gotham's police may be corrupt, there are legitimate questions to be discussed regarding the morality of Batman's vigilantism. But place Batman in the late 1800s and you've got an ideal situation: Gotham, overcrowded and rife with crime a la London of the late Victorian era, where a man can kill a half-dozen prostitutes in notorious fashion and never be discovered. Forensics is in its infancy and the police are overworked and often corrupt. The people - especially those of the lower classes - are desperate for a protector. What better world for someone like Batman? I thought Brian Augustyn's script for Gaslight didn't go quite far enough with the concept. In particular, I think there could have been more about the class war in Gotham and where Batman fit in; and tying Jack the Ripper to Batman's origin was a bit too contrived for my taste. However, the book is saved by Mike Mignola's beautiful art. Augustyn went back to this particular (Else)world with Batman: Master of the Future, which I have yet to read. The paint applications deserve special mention too. This is an area where DCD has had trouble before, but they've gotten a lot better and this figure is a good showcase for that. 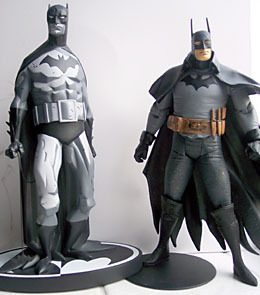 As is usual with DCD, Gaslight Batman's articulation is fairly straightforward: balljointed neck and shoulders, pin-joint elbows and knees, a T-crotch and swivel wrists. Not many options for posing, but the all-important balljointed neck is much appreciated. His right hand is sculpted as if to hold a Batarang, but unfortunately the figure doesn't include any accessories other than the same simple base as the rest of the figures (which, oddly enough, he doesn't stand on very well - the peg is a little too small for the hole in the foot). Even at DCD's infamously high price point of about $15, this is a fairly good deal. 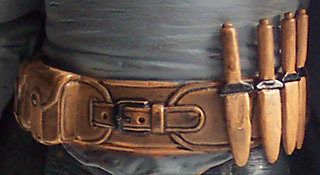 A steampunk-style Batarang would have been appreciated, but the overall quality of the figure makes up for that. 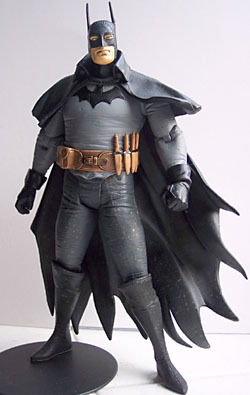 And a general thanks to DCD for making a figure of such an obscure version of Batman. Here's hoping we get something from The Doom That Came to Gotham. What's your favorite Jack the Ripper theory? Tell us on our message board, The Loafing Lounge.